TO BRUGES From the UK you travel to Bruges by ferry or by Eurotunnel: Hull (UK) – Zeebrugge (B) with P&O Ferries. (crossing: 1 night). Take the N31 from Zeebrugge to Brugge. 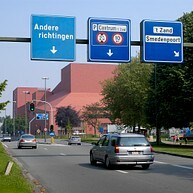 Estimated distance Zeebrugge – Brugge is 17 km or 11 miles (30 min driving). Dover (UK) – Dunkerque (F) with DFDS Seaways (crossing: 2h00). Take the motorway E40 to Brugge. Estimated distance Dunkerque – Brugge is 76 km or 47 miles (1 h driving). Dover (UK) – Calais (F) with P&O Ferries or DFDS Seaways (crossing: 1h30). Estimated distance Calais – Brugge is 120 km or 75 miles (1h30 driving). Folkestone (UK) – Calais (F) via Eurotunnel (35 min). Estimated distance Calais – Brugge is 120 km or 75 miles (1h30 driving). IN BRUGES A 30 kph zone is in force throughout the entire city centre. This means that you are forbidden at all times to drive faster than 30 kilometres per hour. Bruges is a compact city, made for people. The use of motorized transport in the historic city centre is discouraged. There are a number of outlying car parks within easy walking distance of the centre where you can park free of charge. A little further away are the park&ride cark parks, also free, from which you can reach the centre by bike or public transport. A blue zone has been created around the city centre. You can park free of charge for a limited period in this blue zone (max. 4 hours) between 9.00 a.m. and 6.00 p.m. Always remember to use your parking disc! Between 9.00 a.m. and 8.00 p.m. above ground parking in the city centre is limited in time (min. 30 min. and max. 4 hours) and metered, also on Sundays and public holidays (1st hour: €1.80; 2nd, 3rd and 4th hours: €2.40; max. €9 for 4 hours). Payment can be made via an SMS/text message, using the 4411 app (only for Belgian mobile phone numbers) or by cash or bank card at one of the parking ticket machines. The correct number plate of your car must always be entered into the machine. Parking in the city centre for an unlimited period is cheapest in the public cark parks in front of the railway station and under the ’t Zand square. Both car parks are within easy walking distance of the market square, or else you can use one of the city buses operated by De Lijn. The bus transfer (max. 4 people per car) from the station car park to the city centre and back is included in the price of the parking ticket. If you are staying overnight in Bruges, ask your hotel or guesthouse about parking options in the vicinity. Please take note that the following shopping streets will have restricted vehicle access between 1 p.m. and 6 p.m. on Saturdays and during Shopping Sundays (the first Sunday of each month) as well as on the festive season shopping days: Zuidzandstraat, Steenstraat, Geldmuntstraat, Noordzandstraat. There is an exception for visitors who are staying in hotels which are accessed via these streets (hotel Van Eyck, Grand Hotel du Sablon and hotel Acacia). Anyone who does not have accommodation and drives on these streets will be identified using number plate recognition and will receive a ticket. NATIONAL RAIL Every day, there are from one to four direct services each hour between Bruges and the important train junctions at Antwerp, Ghent, Hasselt, Leuven and Brussels. INTERNATIONAL RAIL The Brussels-South Station (Brussel-Zuid/-Bruxelles-Midi) is the Belgian hub for international rail traffic. Numerous high-speed trains arrive in Brussel-Zuid daily, coming from Paris (Thalys/Izy and TGV), Lille (Eurostar, TGV and Thalys), London (Eurostar), Amsterdam (NS InterCity, Thalys and Eurostar) and Cologne (Thalys and ICE). Every day, there are three trains an hour from Brussels-South Station, which stop at Bruges on their way to Ostend, Knokke or Blankenberge. The travelling time between Brussel-Zuid and Bruges is approximately 1 hour. Please consult the Belgian rail website (NMBS) for more details. TO BRUGES >>>Via Brussels Airport-Zaventem The national airport daily receives flights from more than 200 cities in 85 countries. It is easy to travel from Brussels Airport-Zaventem to Bruges by train. Every day there is a direct hourly service to Bruges. In addition, many other trains from Brussels Airport-Zaventem regularly stop at Brussels-North, Brussels-Central or Brussels-South railway stations. From these three stations there are daily three trains an hour stopping at Bruges on their way to Ostend, Knokke or Blankenberge. Taxi rides to and from Brussels national airport are available from Bruges taxi services at a fixed rate of € 200.00 (price adjustments are possible throughout the year). >>> Via Brussels South Charleroi Airport This popular regional airport receives multiple low cost flights every day from various cities and regions in Europe. 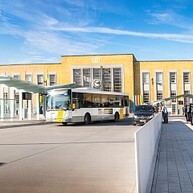 The flibco.com bus company (www.flibco.com) provides several direct shuttle bus services to and from the station in Bruges on a daily basis. 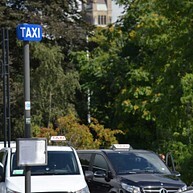 The Bruges taxi services drive to and from Brussels South Charleroi Airport at a fixed rate of € 250.00 (price adjustments throughout the year are possible). 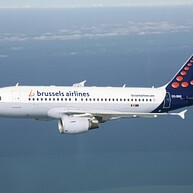 >>> Via Ostend-Bruges Airport The Ostend-Bruges Airport is in full development and systematically expands its offer. The railway station at Ostend is just a 15-minute bus ride away. From here, there are at least three trains to Bruges each hour between 6.00 a.m. and 10.00 p.m., with final destinations in Eupen, Welkenraedt, Brussels Airport-Zaventem, Antwerpen-Centraal or Kortrijk. The train journey to Bruges takes about 15 minutes. Please consult the website of Belgian Railways for more information about timetables and fares. Taxi rides to and from Bruges with the Bruges and Ostend taxi services are charged at the fixed rate of € 70.00. Prices may be adjusted in the course of the year. Several international coach companies organize connections to Bruges from important international transport hubs and foreign cities. The bus stops for these services are on the Sint-Michiels’ side (Spoorwegstraat) of the main railway station. There is also a Flixbus stop on the Bargeplein. TO AND FROM TRANSPORT HUBS From Brussels South Charleroi Airport flibco.com runs several direct services each day. Ouibus organizes direct services from and to Lille-Europe HST station on a daily basis. 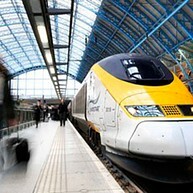 The journey times are arranged to match the times of the Eurostar trains and the TGV. Flixbus has connections to and from several international transport hubs; namely, the TGV/HST stations at Brussel-Zuid (Brussels South) and Lille-Europe, as well as the airports at Frankfurt (terminal 2), Cologne, Brussels (Zaventem), Amsterdam (Schiphol) and Paris (both Charles de Gaulle and Orly). 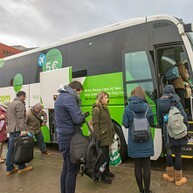 TO AND FROM FOREIGN CITIES Flixbus and Ouibus organize regular services to and from Bruges. The buses stop in various Belgian, Dutch, French, German, English and Czech cities. It is recommended to always book your seat in advance (for some companies it is obligatory). A bus travels between the Station and the city centre and back every 5 minutes. It’s the relaxing way to get to and from the city centre. A ticket allows you to change bus services as many times as you want for a period of 60 minutes. The ticket price is € 3.00. STATION TO CENTRE Bus Lines 1, 2, 3, 4, 6, 11, 12, 13, 14, 16 and 23 bring you into central Brugge and stop within walking distance of the main shopping streets, historic buildings and museums. The city centre stops are ’t Zand (all the above lines except 11), Sint-Salvatorskerk (Lines 1, 4, 6, 13, 14 and 16), O.L.V. Kerk and Dijver (Lines 1, 6, 11, 12 and 16), Markt (Lines 4, 13 and 14) and Stadsschouwburg (Lines 4, 13 and 14). CENTRE TO STATION The service to Brugge Station goes via the stops Stadsschouwburg (Lines 2, 4, 5, 7, 9, 13, 14, 15, 17 and 25), Markt (Lines 2, 4, 13 and 14) and ’t Zand (Lines 2, 5, 7, 9, 12, 15, 17, 23 and 25). Please note! Between 1 pm and 6 pm every Saturday and on the first Sunday of every month, Lines 2, 4, 13 and 14 pass via the stops O.L.V. Kerk and Dijver and not via Markt.